Listed in 1,000 Places to See Before You Die, Greenwich is unique, in that it is actually two concours, back-to-back. Saturday's Concours Americana is exclusively for American makes, while Sunday's Concours International is exclusively for imported marques. The theme of the show is 'Mid-Century Hybrids', which was a special two-day display. Unlike the hybrids of today, these classics were called hybrids because they combined American running gear and V-8 engines with hand-crafted bodies by Italian, French, and British coach makers. We have an amazing assemblage of hybrids including a Facel Vega, Cunningham, Dual Ghia, Iso Grifo, Cobra, Hudson Italia, Fitch Phoenix, and Pantera. This year featured a three-day regatta of classic former America's Cup 12-Meter yachts. Held in association with the 12-M Yacht Development Foundation, these magnificent craft competed for the Greenwich Concours Cup. This years Best of Show honors went to the most deserving vehicle on the field, a Delage D8-120 with coachwork by Letourner et Marchand. In the late 1930s Letourneur et Marchard of Paris built a series of aerodynamic 'coaches profiles' that pushed the typically French pillarless style to its aesthetic limits. 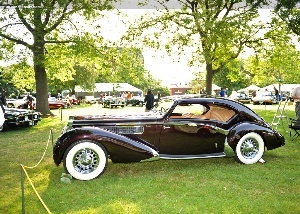 The Delage Company was unable to weather the economic storm of the early 1930s, and its demise in 1935 led to the amalgamation of Delahaye and Delage in 1936. The new company brought out the first D8-120 wîth two cylinders added to the Delahaye 135MS straight-6 engine, bringing the capacity to 4.3-liters. Most of the D8-120s were built on a longer chassis and were very stylish for the period and were owned by the rich and glamorous.